Hello, readers! My baby girl has arrived, and we are over the moon! 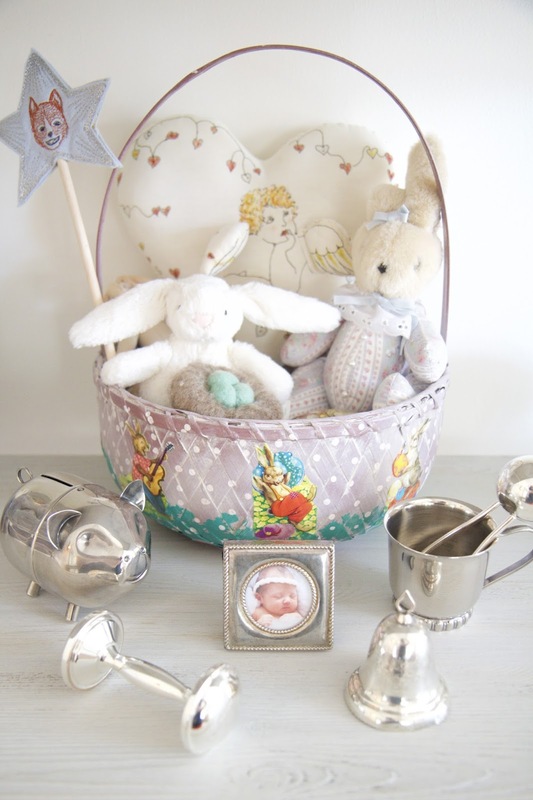 Along with her arrival came the exciting task of designing a nursery. I wanted the room to feel like an extension of the rest of our home with neutral colors; nothing too babyish or bright. The soft gray crib is anchored by a large, floor-to-ceiling Louis Phillipe mirror while two french sconces give the vignette glow and symmetry. I love the way this crib, mirror, and sconce formation emulates the classic bed, headboard, and lamp formation in a bedroom. We converted our chest of drawers into the changing table, making it easy to change our baby and clothe her while keeping diapers and clothes tucked neatly away. A mirror, birds, and photos of our daughter decorate the wall above. A linen glider and ottoman is my ticket to comfort while feeding or reading to my little girl! Positioning the chair between the two windows gives me a lovely view outside. This tall, gray bookshelf displays her collection of books below and stuffed animals above. We painted this originally dark bookshelf a light gray. 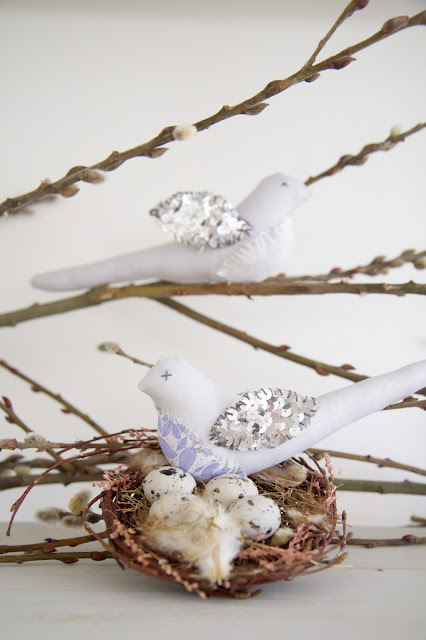 My talented, sweet mother made these beautiful linen and sequin birds from scratch. Aren't they whimsical and perfect for Nora's Nest? 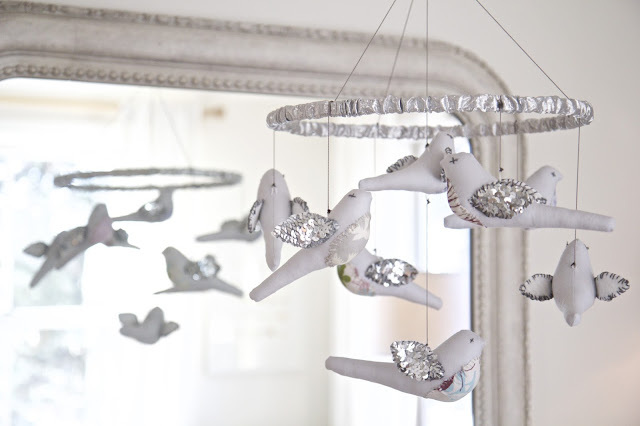 The mobile hangs from a single string, allowing the birds to fly around in a circle and entertain our little one. 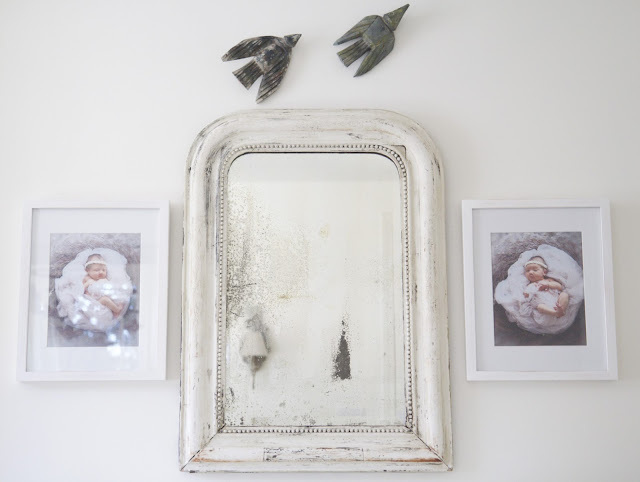 The two Louis Phillipe mirrors reflect each other from over the crib and changing table. Photographs of our baby in a nest flank the antique mirror. These wood-carved birds flew over my room growing up. They now fly over my daughter's room today. Our bundle of joy, all bundled up! 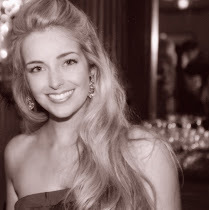 Gorgeous photography by Natasha Halimi. Birds rest on a nest and protect their eggs. A collection of silver and sweet stuffed animals is the focal point of the bookshelf. 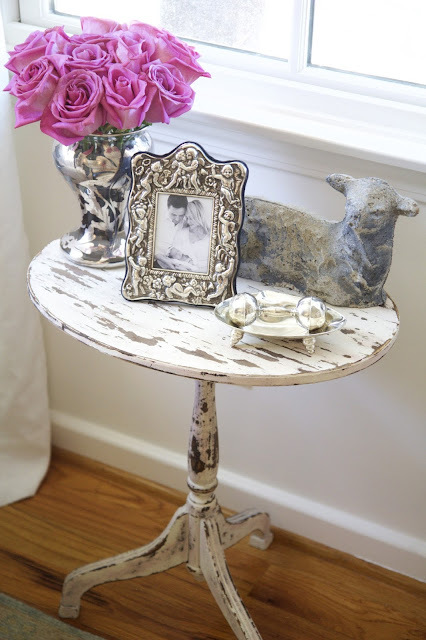 This side table, an amazing flea market find, is perfect for setting down a glass of water or pacifier while I feed my baby. A concrete lamb, a black and white photograph of our new family, and hot pink roses give this little table a big presence. One of the baby gifts I received was this beautiful silver, cherub frame. 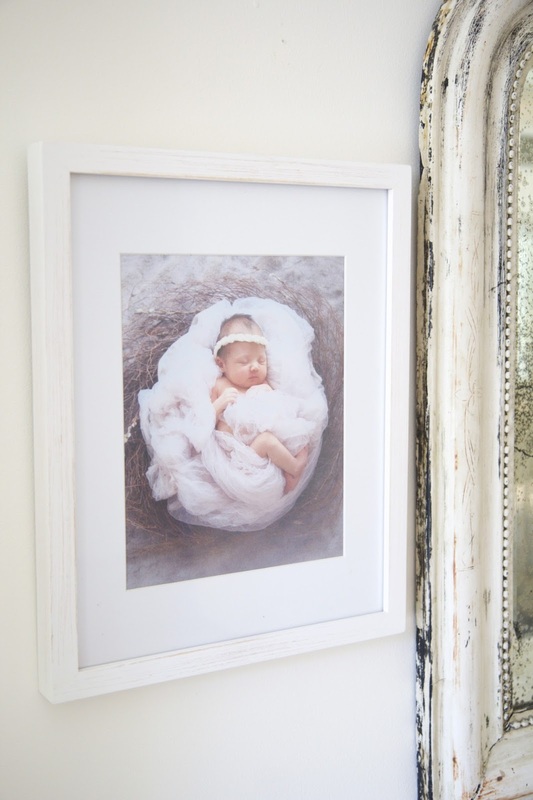 I'm in love with this frame...and our little angel! 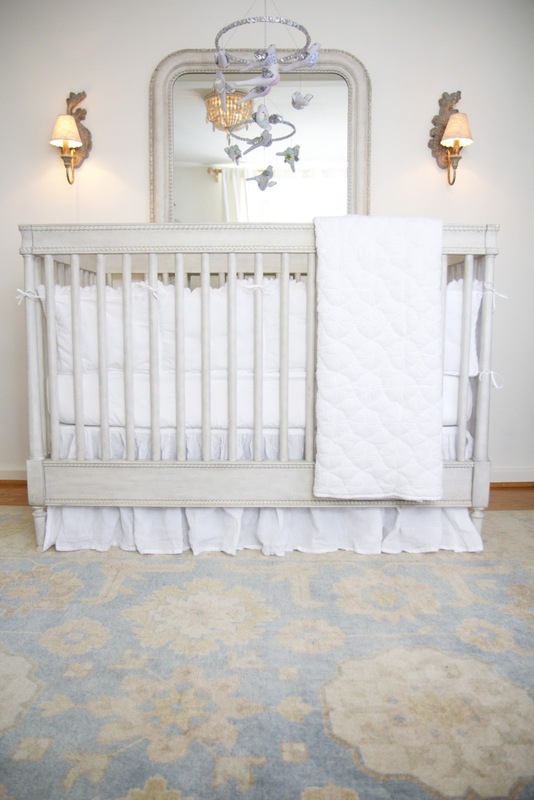 With the nursery's neutral palette, I will be able to add colors and take them away easily through pillows, quilts, and toys. And when the time comes, we can sprinkle the room with accessories of our daughter's favorite color. For more details of our nursery, stay tuned. Thank you for visiting Nora's Nest!